This year, Latvia commemorated 25 years since the Barricades of January 1991. The barricades were defensive barriers put up by people in Riga and other cities in the country as an act of non-violent resistance against troops who were attempting to reassert Soviet power over the nation, which had declared the restoration of its independence the previous year. 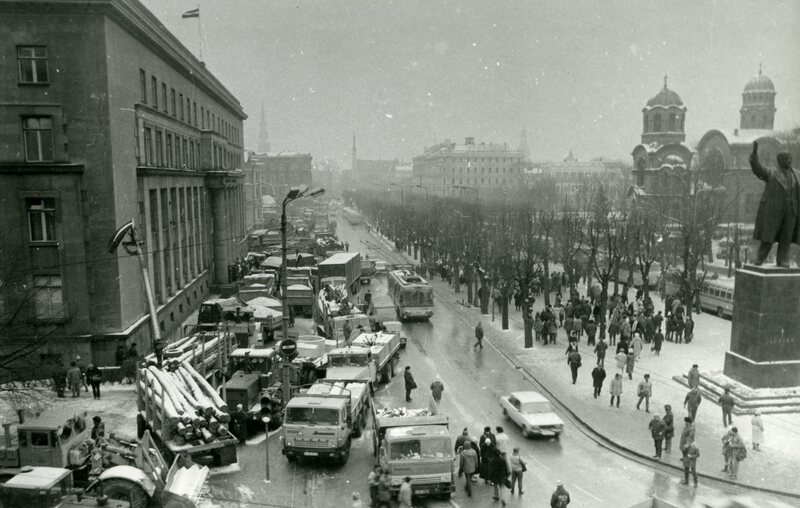 Thousands of people spent over a week camped out in the Old Town and elsewhere in Riga in order to protects sites of national importance, but five people died and many were injured after attacks by OMON, the Soviet special forces. The attempts to seize power failed, however, and on 22nd August, 1991 Iceland became the first country to officially recognise the restored Republic of Latvia. The 25th anniversary of the event was marked by concerts, commemorative events and a partial reconstruction of the Barricades in Dome Square in Riga Old Town. Kaspars Zaltāns tells Deep Baltic what he think this period in Latvia’s history really means, a quarter of a century on. On 4th May 1990, the Parliament of the Latvian Soviet Socialist Republic signed the Declaration of Latvian Independence from the Soviet Union. Today 4th May is a red-letter date in calendars – a nationwide celebration and a day off for schools and workplaces. But the name of this document signed 26 years ago could be a little misleading for younger generation and people who aren’t so familiar with Latvia’s recent history. The phrase “declaration of independence” makes it sound like it only took the signing of one document to get out of the USSR. In reality, the declaration of 4th May only started the process of getting away from the forced union with the USSR, because a long list of crucial questions remained unanswered even afterwards: for example, what to do with Soviet military personnel and facilities; who would become a citizen and who wouldn’t, etc. The Popular Front of Latvia (the mass social/political organisation founded in 1988) and some pragmatic deputies in the Latvian Parliament thought that the USSR could return to its old habits and use repressive methods and brute military force to stop reforms and full independence, as it had done in Hungary in 1956 and Czechoslovakia in 1968. The Popular Front of Latvia developed a plan, called “Instructions for X-hour”, which was published in press in the December 1990. It set out what actions should be taken by general public in case of an act of aggression and hostility from the USSR. The primary idea was that all protest must be non-violent and that everything must be documented with photos and videos so there would be evidence to counter possible Kremlin propaganda. After the bloodshed in Vilnius on January 13, 1991 [when 14 were killed and hundreds injured after Soviet troops tried to seize key buildings in the Lithuanian capital], the ideas stated in the announcement “Instructions for X-hour” were effected by way of a unique form of non-violent civil resistance – building barricades. People constructed physical barriers, using any materials they had, to stop Soviet forces reaching sites of national importance, including the Supreme Council building in Riga Old Town and the TV tower on Zaķusala. The phrase “the Barricades” is typically used to refer to the period between January 13 and January 25-27, 1991. Sometimes this term is expanded as far as the August coup d’état, [when Communist hard-liners in Moscow unsuccessfully tried to seize power from Gorbachev, and tanks again appeared on the streets of the Baltic capitals] because the last barricades (concrete defence structures, blockades) were still standing in Old Rīga in August of that year. People visiting the Museum of the Barricades of 1991 often ask the question “how many people were on the barricades that January?” The numbers mentioned in publications and press typically are taken from two sources: firstly, from the number of people awarded with the Commemorative Medal for Participants of the Barricades of 1991, which is around 32,000; secondly, from the fact that the commander of Soviet forces in the Baltic Military District, General Lieutenant Fyodor Kuzmin, once mentioned that in Riga at that time there were three divisions and thousands of vehicles. But it is my belief we must expand our point of view: we shouldn’t be asking how many people guarded strategically important sites, but what it meant to be on the Barricades. When we visualise the Barricades we think about people from all over Latvia sitting next to bonfires and guarding important structures from possible capture by the Soviet army or pro-Communist organisations. For example, let’s say that people came from Rēzekne in south-eastern Latvia to guard the TV complex. There is no doubt that they were also on Barricades. How about the bus driver who drove them to Rīga and returned to Rēzekne? Was he on the Barricades too? What if the bus broke down, and five mechanics repaired it so people could get to Rīga? Do those people count as well? People from Western countries usually have a simplified view of what happened during the National Awakening in the Baltic states, seeing it as mainly a struggle against the Russians. In fact, during the Barricades of 1991, the film director Zigurds Vidiņš walked through Dome Square and interviewed people, asking whether they were afraid, why they were there, and so on. He found that some of the defenders of the Old Town couldn’t even speak the Latvian language. And, during the Barricades, the blue, red and white flag of Russia flew alongside those of the three Baltic states outside the Council of Ministers building in the centre of Riga. The collapse of Soviet power in Latvia was not about rising up against Russians, but about people who were tired of oppression rising up against the regime. Kaspars Zaltāns is a researcher at The Museum of the Barricades of 1991. He is currently working on a piece about the voluntary units who secured public order during the National Awakening.